Recently a top player approached my wife and suggested she find a mixed doubles partner for tournaments other than her ball-hogging husband and more suited to her level of play. For some uniquely competitive couples, this may be good advice. But for many, including my wife and me, playing doubles together is great fun and adds to the list of shared experiences we get to cherish for years. Even some of our losses provide humorous memories. The pickleball court is simply another venue to enjoy my best friend. This is not to say that we have never had conflict on court. My wife has reminded me several times that a ‘look’ I give her occasionally when she miss-hits a ball is unhelpful; so I am learning how to be an encouraging partner and notch down my competitiveness when we play doubles. Losing, in my case, can be winning. Most marriages will not only survive pickleball court conflict but will benefit. And working together to formulate an effective strategy may even generate a few medals! In tournament play, teams are relentless in hitting nearly every ball to the weaker of the two opponents. This pickleball ‘bullying’ shakes the confidence of weaker players. When things are going poorly for my wife in these situations, I have found that pointing out the flaws in her play and suggesting she become more focused dramatically improves her play. Well, not quite! It is best if I avoid even the the most subtle indications of frustration and simply enjoy being on the court with her and express appreciation that she is willing to partner with me and is trying so hard; after all, the only reason she is playing the sport in the first place is to be with me! Here are five guidelines we find helpful in playing doubles together. It is all good…even losing. For most of us, life — including marriage — transcends pickleball. It is possible to retain perspective while playing pickleball. Have a strategy and talk, talk, talk. Singles can be a lonely sport; doubles ought to be a social sport where partners communicate. I was once reprimanded by the opposing team for hogging so many balls in a match that my wife and I won; Paula responded for me by saying she expected me to take those balls. We were on the same page. Encourage each other in your own unique way … no chest pumps. Find reasons to celebrate one another’s accomplishments: a good shot, an extraordinary effort, winning a point or a game. The best partners acknowledge one another with a paddle touch or some other gesture after every point. Consider developing your own unique method of encouraging one another on court. Hey, you’re married; show some affection! Never admonish your partner in either verbal or nonverbal ways. Lessons are for drills and preparation, not for tourneys or games. Leave your losses on the court, and certainly don’t take them home with you! Set expectations. 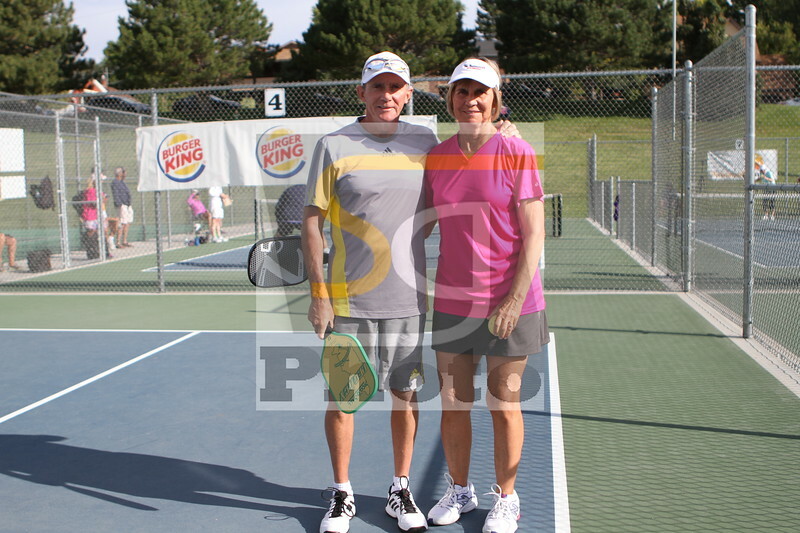 We recently played a better mixed doubles team, and I began by telling my wife we would not win, but that we would try to get a few points. We won the first game 11-1 and my wife played wonderfully. The other team made a needed adjustment and eventually won the match. But we enjoyed shaking them up a bit. Let’s learn something from this. What can we do better next time? Jim says “Yvonne is the perfect partner. She is always positive and supportive. I’m just lucky to be married to someone who can play at a high level and keep me under control, most of the time. If you ever see us play you’ll know there are times when she says ‘do we need a time-out?’. That’s her gentle way of saying, ‘Jim, you better start behaving or I’ll walk off the court.’. Fortunately, it’s a message that usually brings me back to reality. 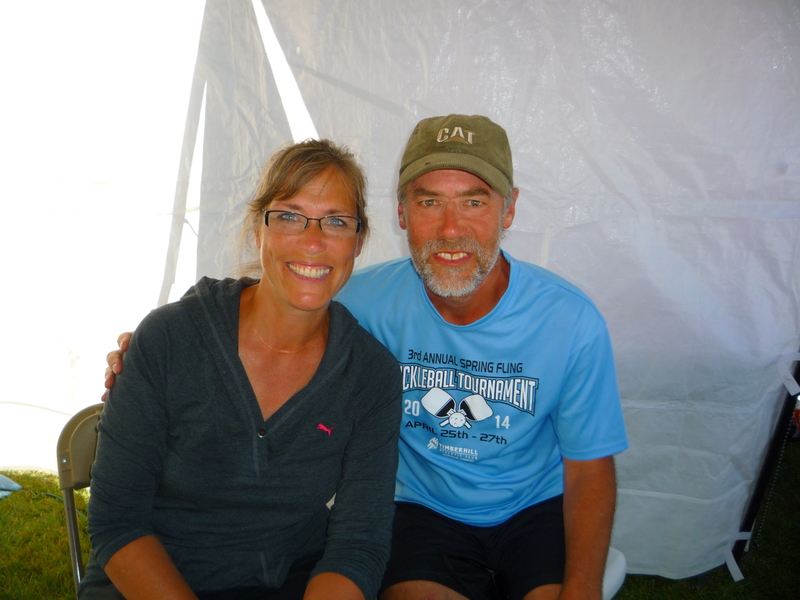 The reality being pickleball is just a game and we’re fortunate to be able to play it together.” Despite the humility in Jim’s comments, he and Yvonne are models on court for sportsmanship, teamwork and extraordinary pickleball. Many of us hope to emulate them. Finally, to those spouses who feel they can never achieve parity with their already accomplished mate, recognize that the barriers to succeed in this sport are far less than other sports such as tennis. And, if the rumored proposal that player ratings be averaged for partners in tournament play is ever adopted, this will make it even easier for many couples to compete. Pickleball, like golf, can be enjoyed for an entire morning or afternoon. We often play for 3-4 hours. My marriage definitely benefits from spending this time together. I have recently told my mixed partner who is my husband that I’d like to play my skill level and let him play his (4.5) because I not only feel like he could do better with a 4.5 partner but that at my level (4.0) and a mixed dbls partner who would also be a 4.0 I’d actually like to know we could medal in it. I also know that the encouragement of my husband ( Capt America) also puts me in a position to only get better as I have to play up to his rating and of course I get most of the balls. So. all in all this article has somewhat changed my mind. Good job guys. I wished I could get her to come out and try it. I never stop trying though and learn that from people like you. In the mean time I play mixed with whoever wants to mix it up with me. Great advice and I love playing with my wife !